So I've been wanting to do something systematic with my teens, something that goes over the basic aspects of Christian living and theology. You know, something like confirmation. And I'm not finding anything (that doesn't cost a fortune) that seems to fit that bill. 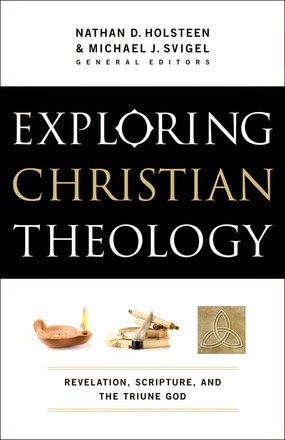 Then I had the chance to review Exploring Christian Theology: Volume 1 by Nathan D. Holsteen and Michael J. Svigel. Both men are Associate Professors of Theological Studies at Dallas Theological Seminary, and their approach is fairly non-denominational. I think this is my answer. This series will include three volumes, and I plan to get more. While this might not quite be my ideal confirmation program, it does cover the doctrines and a lot of issues that are very important. Volume 1 focuses on "Revelation, Scripture, and Truth" in part one, and "God in Three Persons: Father, Son, and Holy Spirit" in part two. We're still working through how to make this work as a family study. One thing that is happening is that we are working on memorizing the suggested passages. Beyond that, we are working at reading through the material and talking about it.